Maths teachers from 38 schools learn how to make maths more interesting for students at the inaugural Maths Day workshop at Ormiston Senior College. Photo supplied. 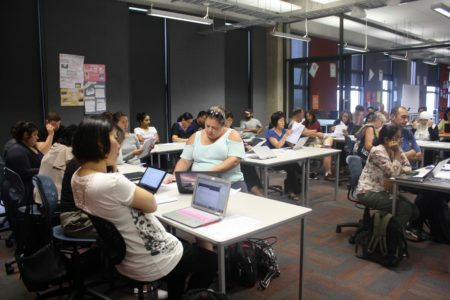 Many teachers fear being critiqued by their peers and may not be open to their ideas being challenged but Subash Chandar K, curriculum leader of maths at Ormiston Senior College believes that hosting a free, professional learning workshop for maths teachers in Auckland would be a perfect springboard for the introduction of technology in the subject. Around 70 teachers from 38 Auckland schools turned up for an inaugural maths day hosted recently at the college. The award-winning maths teacher felt that opening the doors of the college to maths teachers from other schools including Botany Downs Secondary College, Sancta Maria College, Mission Heights Junior College and Howick College, would also give them an opportunity to demonstrate leadership qualities as well showcase the work that the maths department at the senior college is involved in. “It was wonderful to see the teachers connect at the beginning of the year at our college. The workshops inspired teachers at the start of the school year,” says Mr Chandar K, winner of the Jim Campbell award, Kalman award and the Ernest Duncan award. “A lot of teachers may wonder if they are going to get replaced by technology so it was interesting to have our department conduct workshops on how technology can enhance the learning in classrooms,” he says. Four different workshops were. Two-time Ernest Duncan award-winning maths teacher Elizabeth Sneddon led workshops on Personalised Learning in Mathematics and Statistics; Mrs Wiaam Al-Salihi on Teacher Desmos (that creates tasks and makes assessments easier for teachers –as they can see up to 30 screens at one go). Maths teacher Vimal Singh spoke about learning with Sphero robots while Kathryn Albertson conducted workshops on Technology in the Classroom. “ With a shortage of maths teachers who are either retiring or leaving because they can’t afford to live in Auckland, this was a great platform for maths teachers to network, swap ideas and get excited about what they do, says Subash.